Stephen and Anne's life in pink: Thumbs up! Thumbs up!, originally uploaded by skenttaylor. 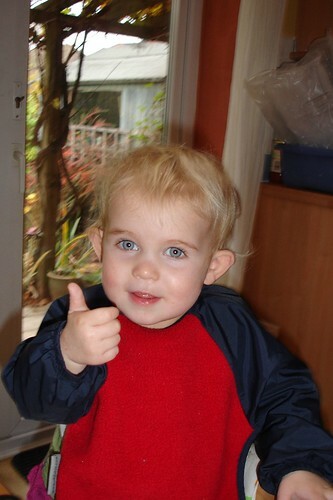 I've been trying for a while now to teach ThingOne to do "Thumbs Up" and she's finally got it, and seems very pleased about it. Now when I leave for work in the morning she stands with her mum at the window like this. Being a parent is very rewarding, and I like to impart my wisdom and skills to ThingOne.